The editor of NYC-based publishing imprint Cicada Press Anastasiya Osipova together with Ukrainian authors presented in Kyiv the newsprint publication Circling the Square: Maidan & Cultural Insurgency in Ukraine within the framework of the discussion about the role of art during the war. The title also can be interpreted as going around the square, whereas the rest of it is more direct. The newspaper was published in New York in spring 2014, after the most violent clashes in Kyiv and the beginning of the Russian aggression in the Crimea. 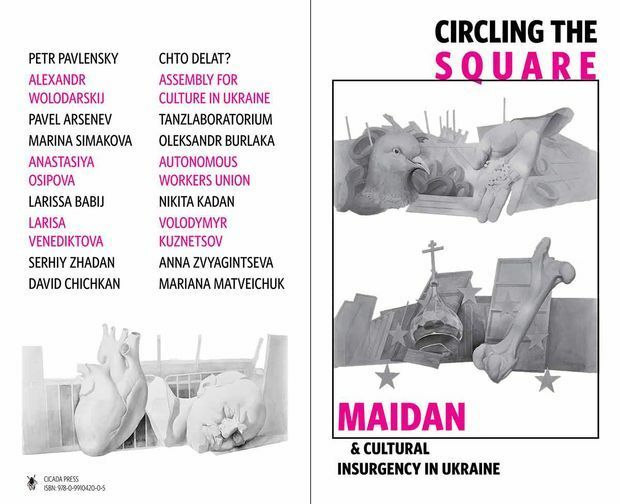 Circling the Square is quite a versatile collection of texts, photos, drawings, in some or other way devoted to Maidan, protest, and modern culture. The contributors include Ukrainian and Russian artists and activists of leftist, liberal, and anarchist views: Serhiy Zhadan, Nikita Kadan, Volodymyr Kuznetsov, Anna Zvyagintseva, Pavel Arsenev, Larissa Babij, Oleksandr Burlaka, Larisa Venediktova, Alexandr Wolodarskij, Mariana Matveichuk, Anastasiya Osipova, Petr Pavlensky, Marina Simakova, David Chichkan, groups Chto Delat? and TanzLaboratorium. The illustrations were created by Volodymyr Kuznetsov, Nikita Kadan, and David Chichkan; there are also report photos from the revolutionary streets and performances. On the whole, Maidan & Cultural Insurgency in Ukraine is a worthy publication: not only is it a kind of textbook for foreigners dedicated to the topic “everything you wanted to know about Maidan, but didn’t know where to ask,” but also one of the so far innumerous attempts to ponder over the revolutionary events in terms of the history of culture and art. The Day met with Anastasiya Osipova and asked her a couple of questions. How did the newspaper emerge? Did the publication meet any response in the US? On the whole, how do Americans highlight and perceive the topic of Ukraine? Have the leftists in the West been able to worthily accept the challenge of Maidan and Ukrainian-Russian war? Do you plan to publish a new publication dedicated to current realities? For much has changed over the past six months.